A complete course in English for Academic Purposes at intermediate level upwards. 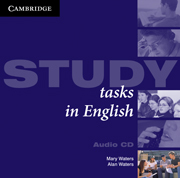 These Audio CDs contain all the listening material from the Student's Book. Transcripts of the listening material are available in the Teacher's Book.